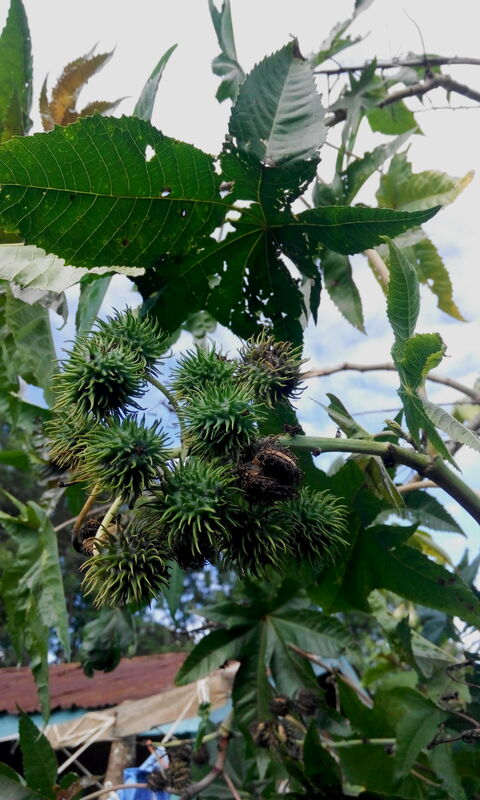 The Mwariki tree, Ricinus communis, is known in English as the Castor oil tree and is said to be native to Africa and India. 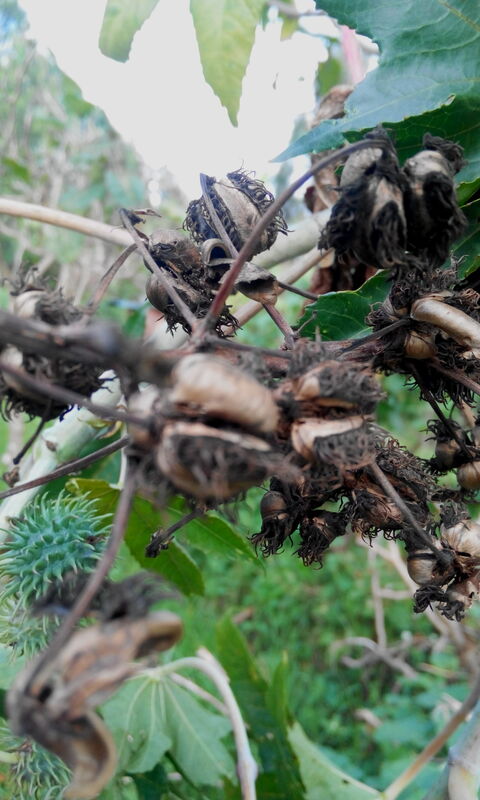 It grows to about 10 to 15 feet and is seen in many rural homesteads all over Kenya as it grows wildly and is literally impossible to eradicate from a homestead. Traditionally it was used by the Gikuyu women to produce oil, Maguta ma Mbariki, an oil that they treasured as a skin conditioner and for many other healing purposes. 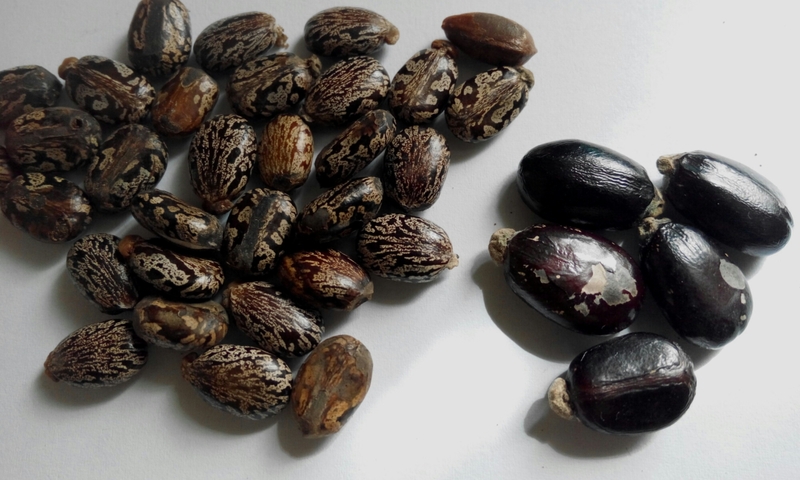 The seeds from which the oil is extracted are called Mbariki and are the size of a thumbnail. They look like ticks without the legs. The seed has a hard smooth skin and has to be crushed in order to reach the oily interior. It is not as hard as the macadamia seed and can be crushed between the thumb and fore finger. A fact sheet of the tree is available here and factual information about it is readily available on the internet. To understand the process of oil extraction from the seeds I visited an old lady friend who took me through the steps. When the seeds have been collected they are roasted while still in their shells on a piece of broken pot, rugio, much like roasting peanuts is done today on a frying pan. The roasted seeds are then wrapped in a leather skin garment, (one without hair), and beaten with a stick so that they are crushed to a paste. The paste is then placed into a pot, Nyungu and water added to nearly full. This is then placed on the fireplace, riko and cooked for several hours. The oil floats on the water and is then carefully drained onto a calabash and then into an oil storage container, Kinandu. The oil is drained as a clean extra virgin grade 1 first and a less pure grade containing some crushed shells finally. This second grade is used to soften all the leather clothes and leather carrying straps, mioho and mikwa. They are spread out in the sun to dry and they become wonderfully soft and shiny. The grade 1 oil is stored for toning the skin, hairdressing and other ceremonies. To leave a pot of cooking castor oil unattended was taboo. This is understandable as the Gikuyu woman’s dwelling, Nyumba was highly flammable and the cooking of this oil a high-risk affair. MUKUYU: Did you also use the oil from a sheep to tone your skin? Here the woman informant looked shocked and disbelieving. In fact her reaction can only best be described if we revert to the original language in which the conversation was held, Gikuyu. Essentially she explained that she was not a man to go smelling like an animal and without mincing words made it clear that men are animals and that it was for this reason that they smear animal fat on themselves. Women, according to her can only ingest animal fat but for beauty purposes, a woman’s oil is castor oil. I followed up this question asking her whether men could use castor oil and again she made it very clear that my generation was very ignorant and I should not tire her with further stupid questions. After a long silence in which I pictured her as a young woman pounding on a mortar with a pestle, I began to see many things that were hidden to a speaking questioner. I sat still. I saw the old grinding stone, now decommissioned, resting under the eaves of her house just near the castor oil plant and suddenly the whole thing became clear and I almost shouted for joy. I remembered Professor Wangari Maathai and her concern for the environment and especially trees. I recalled the legendary, Wang’ombe wa Ihura from Mathira and his reputed wealth in cattle and I remembered Mzee Jomo Kenyatta’s fly whisk and Colobus monkey ceremonial garment, Githii. Yes! According to Gikuyu interpretation of life, men are the guardians of the animal kingdom and women are the guardians of the plant kingdom. That is why men use animal fat and love animals, mahiu. That is why women love and revere the plant kingdom, mimera. Woman, Mumbi was first as a settled sedentary being at the original home, Mukurwe wa Nyagathanga. She was the personification of the Creator, Mumbi, and also the personification of the earth itself, the original potter, Mumbi or Gaia. The Man, Gikuyu, joined her later from his wanderings. He was the domesticator of animals and all domestic animals, mahiu belong to him. Wild animals according to Gikuyu mythology belong to the woman. It is likely that the Gikuyu myth of origin is a coded history of their shift from hunter gatherers and pastoralists into a settled sedentary lifestyle. We are told that the Greek God of the Harvest, the fertility of the earth and agriculture, is Demeter, a woman. This is the Gikuyu Mumbi. What does science say about the topical use of castor oil? Next Post Kīmengemenge Animal Fat – Gīkūyū Healthiest Fat. Thank for this good information. I want to believe the boiling of the seeds was done outside the homestead since they release a very poisonous compound that makes you very dizzy when you inhale the vapour. No. It was done inside the house. In the fireplace at the centre. where can i get pure grade 1 castor oil made in Kenya (strictly not imported)? Alisons Ideal Castor Oil is available at Nakumatt, Tuskys and other big supermarkets. Its made in Kenya and they market it as “Pure Castor Oil” it is surprising that a company in Kenya offers such a high standard in their products but I can testify from use of their Eucalyptus and Almond oils that they are very pure. Try and make your own conclusion.